A few days ago I wrote about how I'd gotten into the Warhammer 40,000 miniature wargame hobby, and had my first batch of troopers ready for action. Today, since the alleged threat of severe winter weather has supposedly been good enough reason to stay inside, I finished the rest of the Space Marines that come with the Warhammer 40,000: Assault on Black Reach intro set. Last night I spent about 4 hours detailing the Space Marine Captain. This morning I set to work on the Dreadnought, which was a lot of fun to play around with! At the top left: 4 Space Marines in Terminator armor. At the top right are 9 Space Marines in standard armor. Between them is an Ultramarine Dreadnought (a crippled Space Marine throw into a "mini AT-AT"). 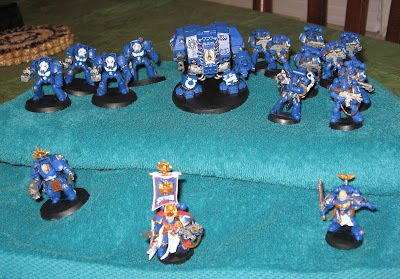 At bottom left is the Terminator Sergeant, while a Space Marine Veteran Sergeant is at the bottom right and between them bearing the Ultramarines banner is the Space Marine Commander. Would you consider doing this for pay? I would love to devote that level of exquisite detail to my Space Wolves army! Shoot me a mail to theknightshift@gmail.com and we'll talk! I'd love to see more detail of the Dreadnought. You did an outstanding job on it. Some drybrushing? Yeah, bit of drybrushing on the Dreadnought and on some of the smaller units' weapons. The Veteran Sergeant has a chainsaw sword that's faintly bloodied with previous battles. It's a great technique that I first used on some Star Wars models over ten years ago and now getting to use it again.